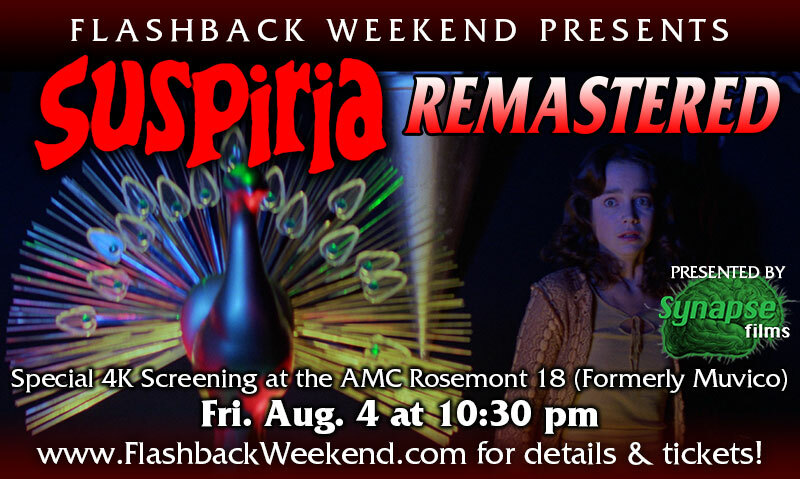 Synapse Films and Flashback Weekend Chicago Horror Convention are proud to announce a special advance screening of the exclusive Synapse Films 40th Anniversary 4K restoration of Dario Argento's masterpiece SUSPIRIA. The 4K screening will be held at the AMC Rosemont 18 (formerly Muvico) located in Rosemont, IL on Friday August 4, 2017 at 10:30 pm. This eagerly awaited restoration was performed by Synapse Films with the full cooperation, supervision and approval of the film’s original Cinematographer, Luciano Tovoli. SUSPIRIA is beautifully restored from the original fully uncensored 35mm Italian camera negative and is presented with the original 4.0 discrete sound mix not heard since the original theatrical release in 1977. Presented in a 4K DCP Presentation. 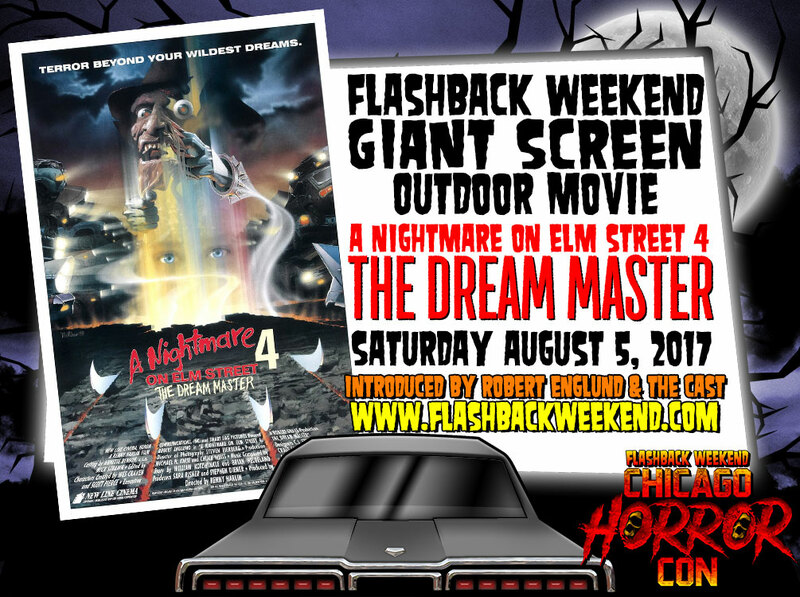 Robert Englund and our Dream Master cast guests introduce an outdoor showing of “NIGHTMARE ON ELM STREET 4: THE DREAM MASTER” (1996) on a giant screen on Saturday, August 5, 2017. This event requires a separate ticket and seating is limited, so get your tickets now! 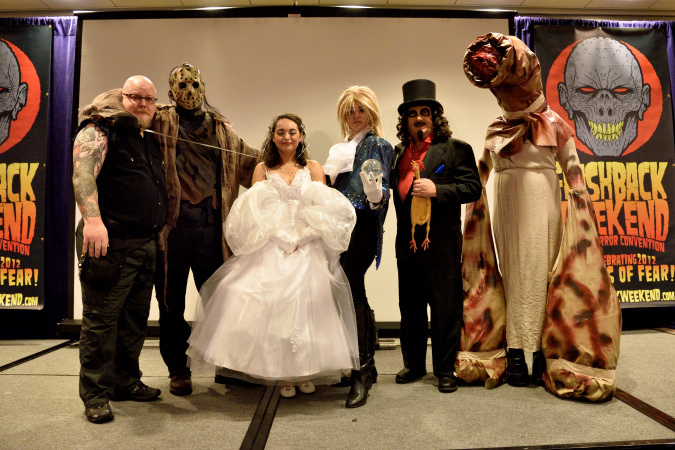 Join us in the Crowne Plaza Ballroom 1 on Saturday August 5 at 4:20 pm in your favorite ghoulish costume for our 12th Annual Sinister Visions Costume Contest and compete for fun and prizes! The contest will be hosted by Chicago Television legend “SVENGOOLIE”! All ages welcome! Join Zombie Army Productions and Kitty Zombie himself at 5:00 pm in the Crowne Plaza Ballroom 1 for a special screening of the pilot episode of The Adventures of Kitty Zombie! 10:30 pm | SUSPIRIA 4K RESTORATION Synapse FIlms' 4K restoration by Don May Jr. & Gerry Chandler. Separate ticket required! Get yours HERE. 5:00 pm | Screening of Zombie Army Productions' "The Adventures of Kitty Zombie", hosted by the show's creators/producers and Kitty Zombie himself! 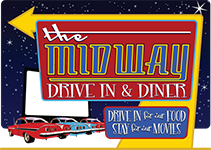 8:15 pm | Giant Screen Outdoor Movie! “NIGHTMARE ON ELM STREET 4: THE DREAM MASTER”. Introduced by Robert Englund and the DREAM MASTER cast, featuring Tuesday Night singing "Nightmare" LIVE! 10:45 pm* | Zombie Army After Party! All Flashback Weekend attendees are invited to party the night away with Zombie Army Productions, featuring a performance by Ron Fitzgerald's Dark Illusion Magic Show! *Approximate - whenever the movie ends, the party starts!